Philadelphia 76ers center Joel Embiid hangs on the rim after dunking during the first quarter against the New Orleans Pelicans at the Wells Fargo Center. It looks like Joel Embiid's ankle is doing just fine. It apparently feels so good, in fact, that the 23-year-old Sixers center is setting his sights on the NBA All-Star Game's highest honor. "I'm going for the MVP," Embiid, who will play in his first All-Star game on Sunday, told reporters after he made a light showing in the Rising Stars game on Friday night. A video of the interview, shared by NBC Sports Philadelphia, shows a characteristically confident and smiling Embiid. Embiid was the lone All-Star playing in the Rising Stars game, which featured 20 U.S. and international players in their first or second seasons in the NBA, and it had looked as though Embiid might miss either the game or the Skills Challenge on Saturday night because of a nagging sore right ankle. He was given an easy night, though, logging fewer minutes than anyone (8:41) and scoring five points as he and Sixers teammates Ben Simmons and Dario Saric helped Team World down Team USA, 155-124. 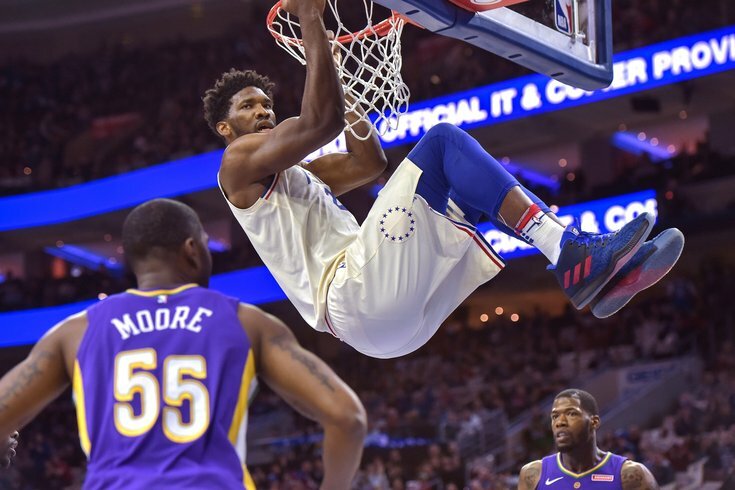 Embiid provided one standout highlight – a dazzling spin move past the Boston Celtics' Jaylen Brown for a two-handed slam dunk. But that was mere child's play, he said on Friday. “Score about 40 points and get 20 rebounds,” Embiid said. "I've gotten close before, so it's possible." Embiid will start on Golden State Warrior Stephen Curry's team alongside James Harden (Houston Rockets), DeMar DeRozan (Toronto Raptors) and Giannis Antetokounmpo (Milwaukee Bucks). The game tips off at 8 p.m. on TNT.